It's unlikely that Vancouver hipster hive the Waldorf Hotel has ever hosted a crowd like the one that came out for Blackberry Winter. The median age was around 45 or 50, denim in all shapes, sizes and decades was on display -- particularly on stage -- and grey was the predominant hair colour. And, damn, did everyone have a great time. 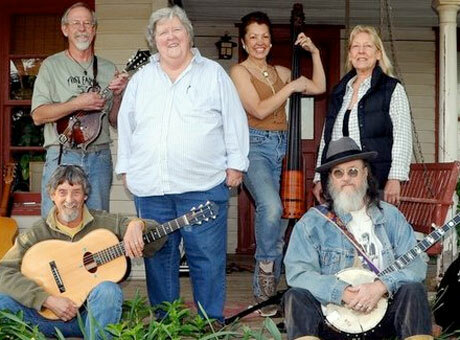 Marideth Sisco, lead singer, and Blackberry Winter (guitarist Bo Brown, banjo player Van Colbert, bassist Tedi May, washboard player Linda Stoffel and guitarist Dennis Crider) found fame as the featured musicians in the 2010 award-winning indie film, Winter's Bone. Until now, the Ozarks Mountain-based musicians have mostly played in and around Missouri, but now the old-time/traditional/folk band are kicking off their first international tour, and Vancouver marked their Canadian debut. Sisco's voice is clear and strong, and her delivery is refreshingly straight-forward. There are no fancy frills or trills, and when the lights went down and Sisco opened the show with a brief solo, set only against the backdrop of frogs croaking in the night, the entire room was transported from the dim, funky cabaret to a clear night under an Ozarks sky. Over the course of two sets, the band meandered through the traditional songs of their roots, old country tunes and new songs, with plenty of down-home storytelling and the occasional hillbilly smack talk. Sisco's charm and gentle twang made for wonderful between-song banter. Whether matter-of-factly discussing the Ozarks's meth manufacturing problem ("When you're poor enough, it's called economic development") or offering up an intro to June Carter's "Big Yellow Peaches" ("It's both a nonsense song and a murder ballad"). Each band member had a chance to flaunt his or her own unique skills. Colbert's banjo number, "Over the Mountain," was a marvel of old-time charm and finger-picking, while May's quavery ode to her great-grandmother, "Broken Glass," was spirited and sweet. But, as Sisco herself admitted, the Ozarks has a dark side, and the band couldn't help but break hearts with their achingly beautiful, bleak salutes to their home, including "Long Journey and Motherland." But they saved the best for last with a hankie-wringing weeper, "Farther Along." Sisco warned the audience that it took her six months of singing it to stop crying midway, and true to her word, there weren't many dry eyes in the house as the audience clapped thunderously, ignoring the tears on their cheeks.